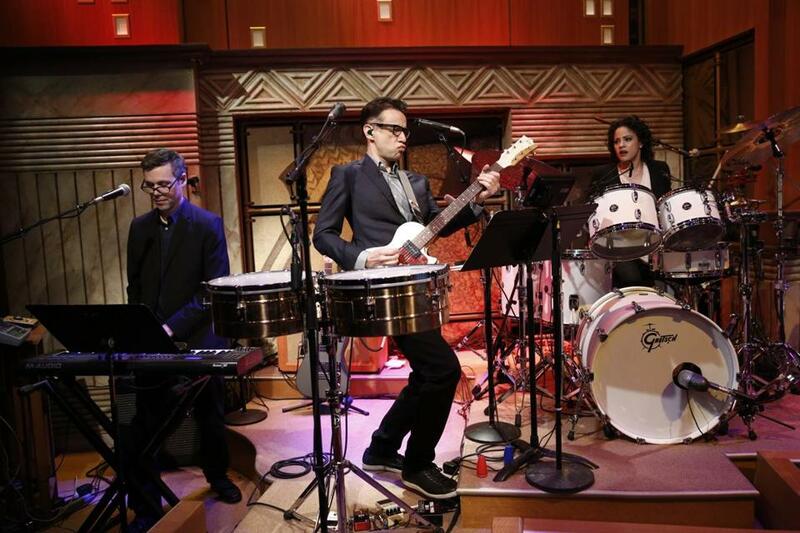 Immediate believability is one of Fred Armisen’s strong suits. So when the actor, comedian, and musician took up his post this past week as leader of the 8G Band on “Late Night With Seth Meyers,” there was barely any disbelief to suspend, he looked right at home. It’s fun to see Armisen back in a rock context (indie-rock fogeys may remember him as the drummer of Trenchmouth in the early ’90s). Scrubbing out the lead guitar part of the nondescript post-punking “Late Night” theme and tucked in among his 8G bandmates, you might not realize Armisen is the guy in charge until he hoists up his guitar to cue the ending. Like Johnny’s Doc, Dave’s Paul, Conan’s Max (or his current Jimmy), and Jimmy’s Quest, Seth’s Fred makes for an endearing sidekick, effectively volleying gags and easing Meyers’s transition into interview mode. As on his cult-hit sketch comedy show with Carrie Brownstein, “Portlandia,” Fred’s Fred isn’t just a character, he’s also a character. Comedically, Armisen is the anti-Jim Carrey, trading prat falls and contortions for a barely-there offness that’s too sunny to be rightly called deadpan. His exchanges with Meyers have been delightfully absurd (plugging a proposed self-help book in which every other word is blank, or a History Channel show that puts a historical spin on “the past hour or so”). Being himself almost always means being someone else; that his ever-present smile could as easily be read as a show of a jolly temperament as a sinister guise somehow only makes him more likable. Which is a good thing since Armisen’s job inside the show is boosting his profile outside of it. In addition to the fourth season of “Portlandia” (which just returned to Thursdays on IFC this week), Armisen is also releasing a series of 7-inch vinyl singles from his long resume of fake bands from “Saturday Night Live,” including the belovedly dowdy Blue Jean Committee (“Massachusetts Afternoon,” anybody?). And while his commitments elsewhere may make his presence on “Late Night” a little spotty (may I suggest drummer Kim Thompson as a natural fill-in? ), for now Armisen looks perfectly at ease playing his original character — the guy cracking up the rest of the band. Michael Andor Brodeur is assistant arts editor at the Globe. He can be reached at mbrodeur@globe.com. Follow him on Twitter @MBrodeur.